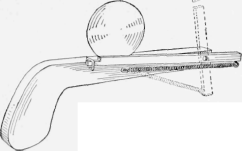 A pistol for throwing small disks of paper or metal balls, can be easily made at almost no expense as shown in the sketch. Two pieces of board, one of which is shaped to the form of a pistol, are hinged together and a fairly strong spiral spring is fastened at the front end of the movable piece and the middle of the other. A slot is sawed in the movable piece to hold the disk, or a small round depression may be formed in it to receive a bean, pea, or shot. The movable arm is folded back and held in position by means of a stirrup of wire fastened on the other part. When the movable part is disengaged by pulling the stirrup away with the finger, the disk will be thrown with considerable force, depending on the strength of the spring.